This long deleted LP finally gets a reissue. Louder Than War’s Craig Chaligne reviews. Since parting ways from the Strawbs in 1973, the duo of Richard Hudson and John Ford had certainly hit the ground running releasing three LP’s in the space of three years for A&M Records. Heavy Touring in the US never enabled the band to build a sufficient audience and proved a bit of a financial burden. For their first (and last effort) for CBS, they choose to concentrate on being a studio project and relied on producer Robin Geoffrey Cable to bring outside musicians to contribute to the tracks. “Daylight” is probably the band’s slickest effort and fans of the Mark II incarnation of 10cc (after Lol Creme and Kevin Godley’s departure) and Wings will find lots to like on this record. 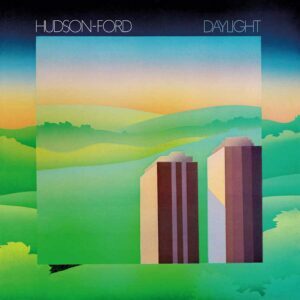 Hudson and Ford don’t box in the same category as Graham Gouldman and Eric Stewart but they are very competent songwriters and the production certainly suits the material. After the brief title track with its carefully crafted harmonies and layers of keyboards, we move to funkier pastures with the catchy “Out of Your Shadow” where our duo manage to fit in strings, brass and some neat lead guitar lines in the space of less than three minutes, assuredly one of the best tracks on the album. “Kiss In The Dark” is built around its guitar hook and “Shy Girl” attempts to revive the funky vibe of “Out of Your Shadow” (albeit slightly less successfully). The two ballads “Let It Rain” and “Poor Boy” pass by without making a huge impression but things pick up again with the catchy guitar lick of “Simple Man” while the one for “Are You Dancing” certainly brings to mind Paul McCartney’s “Coming Up”. “Wicked Lady” meanders a little but the moody “95 In The Shade” with its harmonies “a-la- Turtles” is a great track. The original album is completed by 4 bonus tracks, “Waterfall” is the obligatory reggae track (remember “Dreadlock Holiday” ?) that seemed “de rigueur” at the time while “Lost In The World” is a far better ballad than the ones on the album (the melody of the choruses seems oddly familiar though…). Not a masterpiece but a good album that deserves to be rediscovered.